Finally! At last the day has arrived to give your presentation. PowerPoint for the iPad offers a bunch of ways to give a slide presentation. What’s more, you can draw on slides and do one or two other things to make your presentation livelier. Display the Slide Show toolbar to end a presentation, draw on slides, and black out the screen. To display it, tap at the top of the screen while you’re giving a presentation. The audience can’t see the Slide Show toolbar. From the first slide: On the Slide Show tab, tap the From Start button. From a particular slide: Select a slide in the Slides pane (if necessary) and tap the From Current button. This button (a triangle) is located in the upper‐right corner of the screen and on the Slide Show tab. Prematurely in the middle: Display the Slide Show toolbar and tap End Slide Show on this toolbar. To display the Slide Show toolbar, tap at the top of the screen. Swipe rightward to go to the previous slide. Swipe leftward to go to the next slide. Draw on the screen. Tap the Pen button and drag onscreen to draw on a slide. For example, circle something of importance or draw a check mark to show you’ve finished covering a topic. Tap the Pen button a second time when you finish drawing. To choose a color for drawing, tap the Pen Settings button and choose a color on the drop‐down menu. To erase all the lines you drew, tap the Pen Settings button and choose Clear Pen Markings on the drop‐down menu. You can also choose an eraser on the menu and then drag over lines to erase them. Black out the screen. Tap the Black Out button to make the screen turn black. Black out the screen to get the audience’s undivided attention. To display a slide again, tap the button a second time. If your presentation is being shown on another display such as a projector, you have the option of using Presenter view to give presentations. 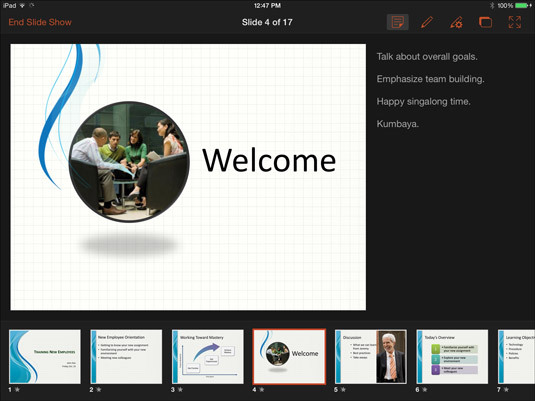 In Presenter view, the full‐screen slide appears on one monitor and a special screen for showing your presentation appears on the iPad, as shown in the illustration here. In this screen, speaker notes are easier to read and you tap thumbnail images to go from slide to slide. On the Slide Show tab, tap the Presenter View button. On the Slide Show toolbar, tap the Presenter View button (the rightmost button on the toolbar). To exit Presenter view, tap the Presenter View button in the upper‐right corner of the screen. Presenter View on the iPad.